This week, The Cruise Examiner reports on a twenty-hour voyage on Un-Cruise Adventures’ 74-berth Wilderness Explorer, one of nine ships now operating in the Un-Cruise fleet in the waters of Alaska, British Columbia, Hawaii, the Galapagos, Costa Rica and Panama. Elsewhere, Semester at Sea is taking on the former Peter Deilmann’s Deutschland as a replacement for the Explorer, which begins service in the Mediterranean as Celestyal Odyssey next month. Earlier this month, The Cruise Examiner disembarked from an interesting twenty-hour voyage on Un-Cruise Adventures’ 74-berth Wilderness Explorer, one of nine ships in the present Un-Cruise fleet. Un-Cruise predecessors began cruising in Alaska in 1998. Included in the voyage were watersports such as kayaking. A specially installed docking platform gives easy access to the water and on board amenities include a sauna, fitness equipment and a hot tub. 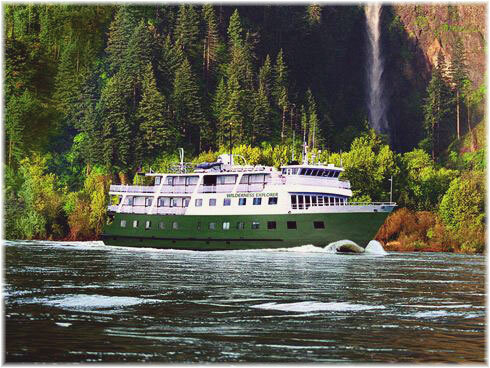 The Explorer is one of three green-hulled adventure ships, the 60-berth Wilderness Adventurer, 76-berth Wilderness Discoverer and the Wilderness Explorer, that form the basic fleet. 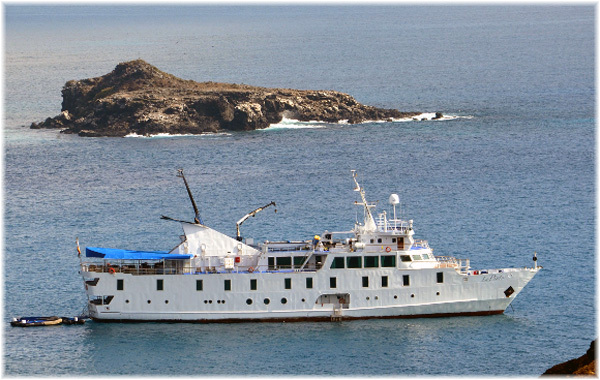 These, until 2013, comprised the fleet of InnerSea Discoveries that were merged with American Safari Cruises to form Un-Cruise Adventures that January. To these have been added five blue-hulled all-inclusive adventure vessels that have more upmarket facilities and larger guest accommodations. Drinks, gratuities and port charges are also included with the blue fleet, which comprises the 84-berth Safari Endeavour, 36-berth Safari Explorer, 22-berth Safari Quest and 64-berth Safari Voyager. Also included with this fleet is the 48-berth La Pinta, which operates in the Galapagos Islands. Presently the Safari Voyager is the only non-US flag ship other than La Pinta, which must be Ecuadorian-flag in order to cruise in the Galapagos. Undergoing refurbishment at Seattle at the moment, this vessel has 270-degree view windows in her main lounge. Registered in St Kitts, she will soon be sailing Costa Rica and the Panama Canal. One last vessel, the 88-guest s.s. Legacy, was added to the fleet in 2013 and cruises the Columbia River, where she offers a more traditional product with lectures and a living history program. She traded briefly in Alaska for Un-Cruise and before that operated for Cruise West as the Spirit of ’98. As for this season, 2015 Alaska departures are now nearly full. Cabins are available on board the Safari Quest on June 12 and the Wilderness Explorer on September 12 and 20. Other departures may have one or two cabins open but choice is now very limited. There is also some availability aboard the Safari Quest for Yachters’ British Columbia departures between September and November that include the stunning Princess Louisa Inlet. Bookings made before this Friday, May 15, will attract a reduction of $200 per passenger in Alaska and $100 a head to British Columbia. With few open cabins remaining on applicable Alaska and British Columbia departures, act now. The recent bankruptcy of both the owners and operators of Peter Deilmann’s ms Deutschland have led to her going to Semester at Sea to replace another German-built ship of similar age. Semester at Sea is in the process of moving away from ship ownership back to ship chartering, as it had been with previous vessels. With the ms Explorer going to Louis Cruises as their Celestyal Odyssey next month, Semester at Sea was in need of a new vessel and has been looking for some months now. The Deutschland, which seems likely to be renamed, will be Semester at Sea’s sixth oceangoing campus in its fifty-two year history. Since 1963, Semester at Sea has used the Europe-Canada Line’s ms Seven Seas, Holland America Line’s ss Ryndam, C Y Tung’s ss Universe (ex-ss Atlantic) and ss Universe Explorer (ex-ss Brasil) and the last Explorer. The organisation’s Spring 2016 voyage is scheduled to leave Ensenada, Mexico, on January 5, 2016, and complete in Southampton on April 15, sailing via Honolulu, Japan, Chinese ports, Vietnam, Singapore, Burma, India, Mauritius, South Africa and Ghana.